Wellness Orbit's online training platform is dedicated to mental wellness and improving human capacity. All high quality e-trainings in this mental wellness gym are designed to enable teams to develop healthy and sustainable work patterns in modern knowledge-based and creative economies. The very unique approach available here enables your team to prevent mental health problems (such as stress, burnout, anxiety and depression) and improve productivity. The aim of Wellness Orbit is to empower everyone in doing what they already do, only better. Mental wellness – the foundation of excellent mental health and physical health. Wellness Orbit was born out of a need. When it comes to mental health and internal health in general, the main focus has been on disorders and the cure. This narrow approach has left people feeling that mental health has no relevance in life unless a mental illness occurs, up until now. In reality all humans possess an internal realm and experience thousands of different intrapersonal events ('intra', meaning inside) on a daily basis. Feeling emotions, learning, thinking, planning, focusing and leading our attention, having an ability to investigate, take initiative, gain insights etc can all affect our internal realms. Mental wellness in its rightful context means a certain ease in directing all of those internal processes. Mental wellness is something that enables us to contribute and live our lives to the fullest. Wellness Orbit enables to access intrapersonal skills and mental wellness related know-how 24/7. The trainings are accessible to you and your team anywhere where there is Internet connection that is able to play FullHD video. Best of all every single Wellness Orbit training session here is taught in a way that is simple, practical, improving mental fitness and productivity of your employees. In essence Wellness Orbit is world's first a fully digital mental wellness gym for teams. Our aim is to disrupt the very stagnant arena of mental health with a new science based proactive approach towards mental wellness. Wellness Orbit online trainings for your employees are a unique coming-together of three very different worlds, medicine, entrepreneurship and awareness, inspired by The Art of Conscious Change™ teachings. All Wellness Orbit e-trainings are developed and conducted by Dr Helena Lass, our spark and soul. 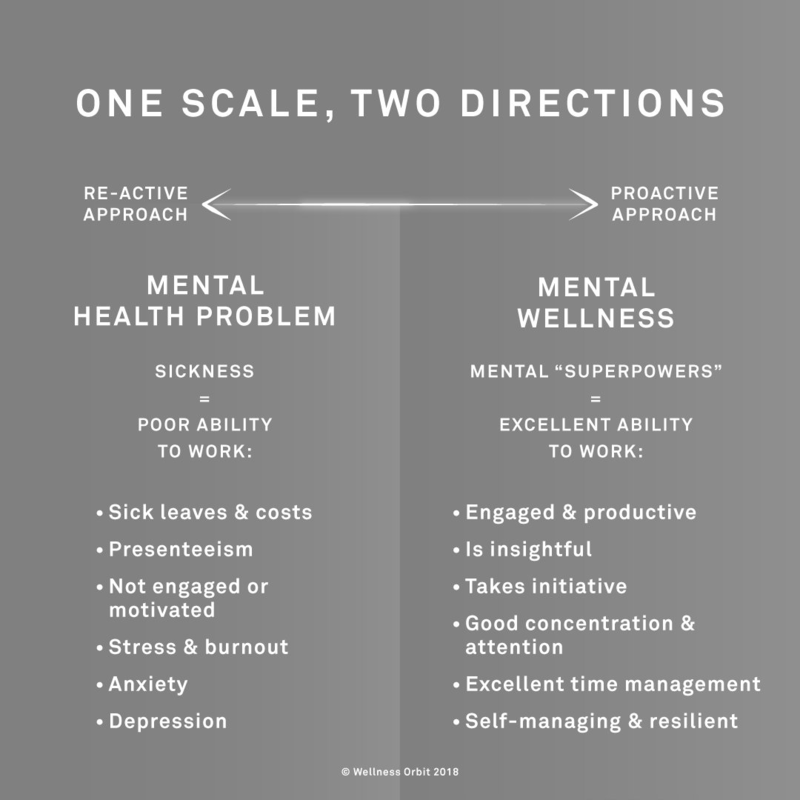 Dr Helena Lass founded this fully digital mental wellness gym with the aim to make high quality mental wellness trainings easily accessible for all workplaces. This approach has never been used before in a scalable digital format and is a global paradigm shift from reactive approach towards mental health to a new proactive approach towards mental wellness. Our mission is to improve overall mental wellness in companies and organizations and on an individual level. We see that companies and organizations experience huge financial loss from a lack of mental health and therefore stand to win most by making mental wellness gym trainings available for their teams. Our 9 promises to you and your team are listed here. We see that wellness orbits around intrapersonal skills. We see mental wellness as the foundation for purposeful action, not as a reward or separate from everyday tasks. When workplaces make intrapersonal education available for their employees they build a sustainable foundation for improving productivity, professional skills and overall workplace wellness. Enable your team to improve intrapersonal skills with Dr Helena Lass in order to secure good mental wellness and efficient use of all existing professional skills. Welcome to the mental wellness gym! The proof that Dr Lass is a top expert is her scientific paper about proactive mental wellness and personal sustainability that was published 2018 globally by Routledge - the world's leading academic publisher in the Humanities and Social Sciences. Wellness Orbit is a member of Connected Health – an Estonian HealthTech cluster that is part of the European Connected Health Alliance and ScanBalt network. Read the introduction of Wellness Orbit by Connected Health. Intra-personal skills; Intra-personal wellness; Intra-personal education; awareness; consciousness; mindfulness; entrepreneurial mind-set; initiative; personal initiative; self-leadership; personal responsibility, employee engagement; work engagement; employee wellness programs; workplace wellbeing initiatives; workplace wellbeing trainings; workplace wellness; corporate wellness; corporate wellbeing; employe wellness; employee training; staff training; business training; science-practice integration; mental wellbeing; mental wellness; proactive mental wellness; proactive mental health; stress reduction training; stress prevention training; mindfulness-based stress reduction program; MBSR; stress management; proactive stress management; stress prevention; burnout prevention; avoiding employee burnout; work related burnout; workplace burnout; adrenal burnout; adrenal fatigue; anxiety prevention; depression prevention; online training; online learning; e-learning; e-training; fully digital training; easy access; quiz; test; metrics; pre and post training assessment; self-assessment questionnaire; feedback; interactive participation; workbook; group discussion guidelines; Full HD videos; professional videos; professional studio sound; elegant custom made graphics; expert trainer; professional trainer; mental wellness expert; psychiatrist; Dr. Helena Lass; HealtTech; trainings in English; self-service; digital facilitation; no hidden fees; secure credit card payment; instant invoice after payment; no hassle; EU registered company; honest and ethical business.